The Stratford Public Safety Communications Center (SPSCC) is a Police, EMS and Fire dispatch center providing state-of-the-art equipment and facilities to answer emergency 9-1-1 calls. The center is staffed by 3 dispatchers, 24 hours a day. 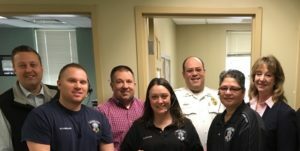 Dispatchers are trained Connecticut Public Safety Telecommunicators and National Emergency Law, Fire and Medical Dispatchers through the International Academies of Emergency Dispatch (IAED). The Stratford Public Safety Communications Center is the primary PSAP for the Town of Stratford. They are responsible for manning the E911 center and dispatching police, EMS and/or fire units to over 40,000 calls per year. They process over 128,000 inbound and outbound phone calls per year (350 per day). With all of that, they are also required to perform numerous tasks due to the 24/7/365 nature of their operation. This includes but is not limited to: performing law enforcement database checks, performing emergency medical dispatch per state of CT statute, monitoring field assets at emergency scenes like structure fires, administrative notifications and even weather station monitoring. Further the center plays an active role in the Towns EOC operations. Our center has gone through several large technological updates which were not easy on the staff. Our team of professional dispatchers have worked so hard over the past few years to collaboratively overcome immense technological and administrative change, all the while, maintaining consistent performance and even improving performance over that time. We would love to get them some recognition for all of their hard work, especially from a well known, national body such as APCO. I am especially proud of their general consistency in performance and perseverance through times of challenge and change.